Architect: Tom P. Barnett Co. Developed by Edward Mallinckrodt as downtown’s first office building with an enclosed shopping arcade, the Arcade Building (also known as the Arcade-Wright Building) envelops the earlier Wright Building (1906) at the northwest corner of Eighth and Pine streets, designed by Eames & Young. Master of the picturesque and eclectic Tom P. Barnett designed the new building in the Gothic Revival style, a stylistic idiom well-suited to the two-story vaulted arcade inside. Construction began in 1917 while World War I claimed America’s steel supply, so the Arcade was built in reinforced concrete. Briefly, the building was the world’s largest reinforced concrete building. The exterior today retains the building’s characteristic lancet arched retail and entrance openings, with ornate bosses, terra cotta tracery at the top of the northern section, and dramatic bay windows facing Eighth and Olive streets. Gone is the original terra cotta cladding on the piers that terminated in projecting gargoyles above; the piers were reclad in brick during the 1930s after failure on the terra cotta anchoring. The Aracde closed its interior in 1979, and the last retail tenants (and most of the brass fixtures, including exterior and interior lights and the building’s name plaques) were gone by the time the Pyramid Companies purchased the building in 2001. Pyramid started rehabilitation in 2007, but stopped when the company closed its doors in 2008. Today, a new redevelopment plan is close to being set while the City of St. Louis has resumed interior demolition work. The brochure published here is an undated promotional publication of the Isaac T. Cook & Company, which managed the Arcade Building. Cook & Company maintained its office in the Arcade Building upon its completion in 1919. 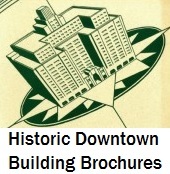 This brochure includes illustrations of the new building as well as several floor plans. Notations on the plans come from Arthur Fuldner, agent for Oreon E. & R. G. Scott, from whose files the brochure comes. Interesting that the brochure noted the presence of not one, but eight different streetcar lines, “linking…with the principal residential sections of St. Louis”, running right by its front doors. And now we’re made slaves to the automobile and the companies producing the fuel for them. Eduoard Bernays’ lovechild, modern MarketingPRopaganda, has thoroughly saturated our psyches, and secured our fealty to the status quo. And most Americans don’t even know the extent to which they’ve been brainwashed. For instance the Cherokee line mentioned in the brochure, by the date of this map was a bus line that ended up on 14th street downtown. The Arcade building site at the time of this 50’s map has shows three streetcar lines, all going west, two of them going to the county, that is all. I didn’t read detail of the various routes that were given except for the streetcar, but the map indicates that no bus lines went to the Arcade building. Starving downtown of transit is certainly a possible way to kill downtown, and the city. Welcome to oil soaked America.